Diameter 16 - 63 mm. Diameter 16 - 75 mm. Diameter 40 - 125 mm. The hand welders are intended for Professionals because they are equipped by an exact electronic control and an original acoustic weld guide, TraceWeld (depending on type). The most interesting advantage is their possible continuous operation even under demanding conditions. The best selling group, the rod welders with power demand of 650W, allow operation in very confined spaces and the possibility of attaching up to three adaptors at once. For that, who prefer traditional plate welders, we offer the knife version with the power demand of attaching two adaptors at once. For welding of big diameters of up to 125 mm we offer the 1200W plate welder. 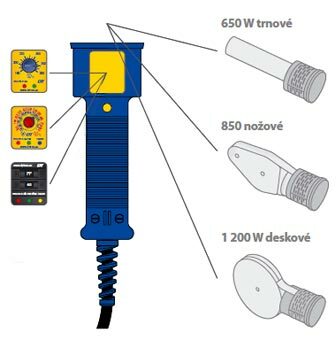 A wide range of instruments with different features with appropriate using in various situations can be proposed by a modular order of the electronic hand welders for professionals range. Heating elements are designed with regard to achieving of the required thermal power and to the maximum of availability at welding in confined and poorly accessible space. 3 various types of the heat regulation can be combined by three types of the heating elements. 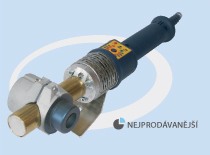 From the point of the view of completing are the welders supplied in 3 versions – SOLO (the only welder) and in the sets of MINI or PROFI versions, which can be delivered either with black, or blue DT coating of adaptors. More information in product details. During its development, our company strives to equip our welding machines with the best and most reliable control features and to find new ways of how to improve the weld quality. 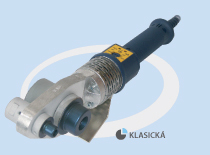 Therefore, we have developed the original TraceWeld® system that significantly improves and simplifies the process of socket fusion welding because the operator is acoustically signalled the passage of all significant technological times of the welding process. For correct functioning of this system, it is only necessary to set the pipe diameter and welding temperature, for the type of P-4b diameter and material are needed. 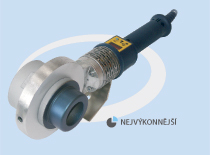 After placing the fitting and the pipe in the adaptor, just press a push buton and make the weld according to the acoustic signals without the necessity to monitor time. Short audio signal indicates the beginning of the welding process, i.e. heating of the pipe and fitting to be welded. Quickly interrupted audio signal defines the phase for connecting of the pre-heated pipe and fitting. Long audio signal indicates the end of the welding process. In this moment, the weld fixed during the process may be released. Three various types of temperature control with three types of heating elements can be combined.